Apologies: I don't recall what the original title of this thread was. Glue inspired by slugs shows promise in repairing damaged tissue A glue inspired by slugs that adheres to wet surfaces has been developed and could be used to repair damaged tissues, including a damaged beating heart, a study published in Science suggests. The flexible yet tough adhesive was tested on a beating pig heart as well as other tissues and worked better than available surgical glues, researchers say. I've heard that slime from snails and slugs has interesting properties. They are both slimy and slippery at the same time. Slimy, slippery and disgusting. Still, if my guts needed gluing, I wouldn't turn up my nose at it. Oh, the strangest thing I've heard lately is that Canada has a strategic maple syrup reserve and a large part of it was stolen. But they got it back. In doing a bit of on-line research, I found that they don't do it to prevent shortage during say a war. They do it to stabilize the price. Apparently there are so many places producing maple syrup and using it in Canada that they have a national interest in moderating fluctuations in the price. Okay, that part makes some sense. But who wants to use maple syrup that was stolen and then recovered? My first thought was, if the thieves licked, would Canada want it back? I guess they could reboil it. What about your cats? I like snakes pretty well, but the beasts living in the Okifenoki (sp?) and the Everglades are too huge and are eating the local wildlife. Yeah, they have a real problem with them down there. Now I don’t mind snakes as pets at all, but DO have a policy against pets that can strangle you in your sleep. Sorry, but them’s the rules. Hey, ya gotta draw the line somewhere! Mine is also at something that could strangle me in my sleep. I thought that boas were cool until an acquaintance's big pet belted me to a chair and it was pretty clear that he could just squish the life out of me. All it took was tickling his tail to get him to get off, but I don't want a pet that could strangle me in my awake. This is not a news story, but the thread seems to have shifted to strange pet stories. When I was a kid, I used to hang out at a fish and aquarium store. The owner sold us a variety of fresh and saltwater fish which I attempted to keep alive with varying degrees of success. One day he told me a story about another fish enthusiast that he knew. The guy had a big saltwater aquarium and really knew what he was doing. He had several thousand dollars of fish, anemones, corals, etc. At some point, he decided that he wanted to get an octopus. He knew that an octopus would not be friendly to his prized fishes, so he set up his octopus in a tank of its own. Over the next several weeks, he noticed that some of his prized fish seemed to have disappeared. He was puzzled and thought they might have died and were just hidden in the corals. He moved some corals around to try and find them. Rotting fish could poison the water in the tank, so he wanted to get them out. Strangely, though, the supposedly dead fish were no where to be found. One night after he usually went to bed, he decided to check on his fish. He turned on the lights and saw his octopus slithering along the wall from its tank to the big fish tank. He was astonished, but fascinated. The octopus ignored him and continued slithering until it got to the fish tank. In the octopus crawled. Not wanting to loose any more expensive fish to ravenous octopus predation, the aquarist reached for his fish net, caught the naughty octopus, and returned it to its tank. After that, he installed a full cover over the octopus tank and weighed it down for good measure. This story was my first lesson in just how smart octopi are. That happened in a marine science lab, too. Thos rascals are smart! I don't regard the boas as pets any more. They are a nonnative invasive species. Octopus are surprisingly intelligent and resourceful. I watched a YouTube clip about a couple that spotted one beached and in bad shape. They put it back in the water. The next day while they were walking the shore again it came and went along with them in the shallows for a long time. Sounds like a very grateful octopus. I love it that he doesn't want to come out, he just wants the lid off. I saw an octopus opening a jar like thin on some documentary. If they ever evolve to leave the ocean, it may not be long before they learn to start fires. He wants to know he can get out. But he has no shelter out. Clever. I would want that lid off, too, in that small space. Slithering things give me the creeps. Prairie voles, which like humans form long-term monogamous relationships, can hit a rough patch when the male partner consumes more alcohol than the female, according to a study being presented this month at the Society for Neuroscience annual meeting. Researchers found that males that drank more alcohol than their female partners were more likely to mate with a different female, suggesting there may be a biological basis for relationship failures. Great. Die now or lose your brains later. What a choice. Alzheimer's disease may be transmissible through blood transfusions or surgical equipment, a study published in Molecular Psychiatry suggests. Researchers connected mice that were engineered to have Alzheimer's brain plaques to healthy mice, and the healthy ones began developing beta-amyloid protein plaques in their brains as well. Easy Coolwater, you're going to violate the unspoken rule of this forum that a maximum of four posts can be written in a week. You keep this up and some of these threads are going to hit a second page or, god forbid, an 8-month old post might get bumped off the front page. If Alzheimer's can be transmitted by blood, does that suggest that it may be caused by some sort of virus? Edit: Just looked at the article. It is suggesting something like a prion. Scary possibility. Hope I don't need a blood transfusion! But n, people are counting on me to bring them the strange and wonderful. This vid doesn't tell you, but the Japanese researchers were interested in how the beetles avoid being digested. Some of the beetles were down there for almost two hours before the frogs barfed them up, but it doesn't seem to have hurt them. The researchers were also trying to explain why frogs full of scalding chemicals aren't injured, either. And they could hear the beetles' explosions INSIDE the toads! I think they just posted the vid because they couldn't stop laughing. 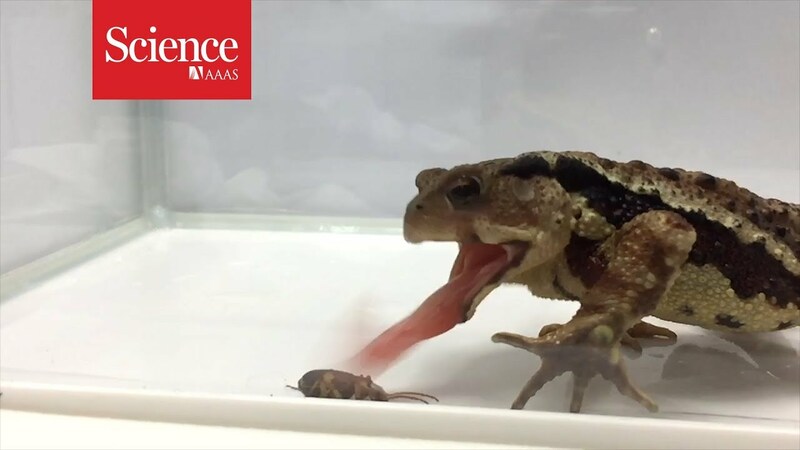 Don't you love the look on the frogs face as he swallows the bug? We have bombardier bugs here, but I had no idea they could do that. Guess I've never grabbed one.